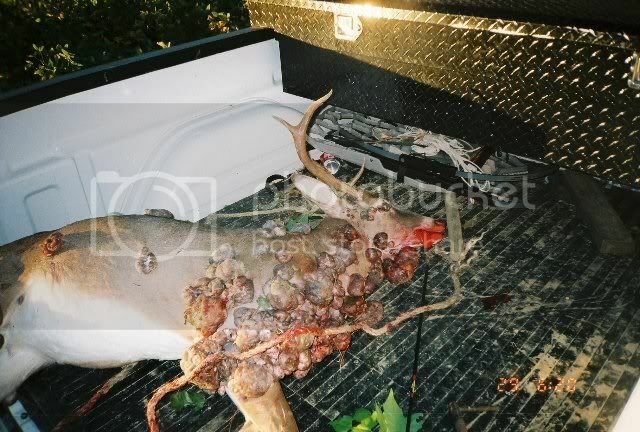 This Deer is getting emailed around the net, kindof disturbing! 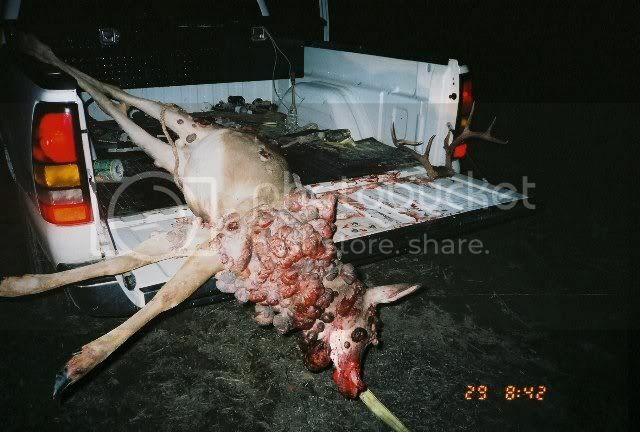 Have you ever seen anything like this on a deer before? I read someone thinking they might be warts but I dunno... cancer maybe? Bot flys? I dont believe I would even touch that animal! Do you know where it came from? I dont know about any of you but I'd have took some pictures where it dropped, put my tag on it, and put the contents of a gas tank on it and lit it. Maybe at most I'd have called the Ministry of Natural Resources to see whats up. They would shave surly the deer. I think someone did the poor thing a favor. I've never seen or heard of such a thing. Never seen anything like it It had to have bothered him i agree 1895ss someone did him a favor thats a shame!! If anybody does hear as to what this is, Please post it. It may sound sick but I would like to know. I hope the animal did not have to live like that for long. Intersting reading for it. Seems it is a virus deer can contract. Could that be an extreme case of Bovine TB? Says its fairly painless and not a health hazard, just cosmetic. Thanks DallanC, but it sure looks gross doesn't it. I certainly would not butcher it. I think we need to see what "Urban Legends" has to say about it. PETA probably created the pic to keeps kids from wanting to hunt. My dad shot a buck White Tail in Pennsylvania must be twenty years ago. Upon skin removal we discovered the neck most of the body covered with tumors. 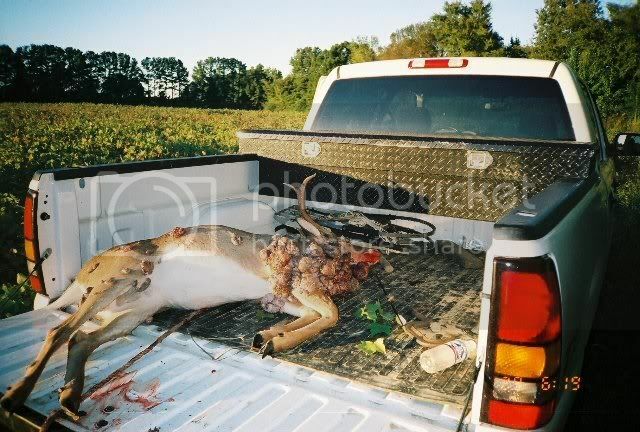 The deer outwardly looked ok. A friend who was a meat cutter, by trade, told us he wouldn't feed it to his dogs. We kind of felt the same way. I don't think about animals getting dease like cancer and the such. I suppose we are so inclined to think we are the only ones that get sick and die. I killed a 6 pointer this year and one side of his body inside of his skin was all bloody and had a open hole to his guts, the other side was perfect with a layer of fat. He was walking with no limp and he was very alert when I shot him, neck at 85, 7mm WSM. We don't allow dog hunting on our farms and the bucks only run after does not from dogs. Needless to say I didn't eat the deer and I alway use rubber gloves and look somewhat like a proctologist (I must because my wife won't turn her back to me) when I clean a deer.